ในวันที่ 27 มีนาคม ทนายความฝ่ายจำเลยยื่นข้อเสนอให้โฮมส์รับผิด เพื่อแลกกับการที่ฝ่ายโจทก์ตกลงที่จะไม่ขอให้มีการลงโทษประหารชีวิต ต่อมาในวันที่ 1 เมษายน ฝ่ายโจทย์ประกาศว่าจำเลยปฏิเสธข้อเสนอ โดยอัยการเขตอะแรพาโฮเคาน์ตี จอร์จ บร็อกเลอร์ ประกาศว่า "ตั้งใจและต้องการให้เจมส์ อีแกน โฮมส์ได้รับโทษประหารชีวิต"
เมื่อถูกจับกุม นายโฮมส์บอกกับเจ้าหน้าที่ตำรวจว่ามีระเบิดอยู่ในที่พักของเขา ที่อยู่ทางตอนเหนือของออโรรา ตำรวจจึงทำการเข้าไปตรวจสอบบ้านของผู้ต้องหา ซึ่งอยู่ห่างจากจุดเกิดเหตุไป 8 กิโลเมตร โดยเข้าไปตรวจด้วยความระมัดระวังว่าอาจมีระเบิด อาคารอพาร์ทเมนต์ ที่ผู้ต้องหาอยู่อาศัยเป็นอาคารที่มีให้เฉพาะนักศึกษา คนไข้ และเจ้าหน้าที่ของศูนย์การแพทย์มหาวิทยาลัยโคโลราโดเท่านั้น เจ้าหน้าที่ตำรวจรายงานว่า โฮมส์บอกกับตำรวจว่าเขาได้ทำการวางกับระเบิดไว้ในอพาร์ตเมนต์ของตัวเองก่อนที่จะเดินทางไปโรงภาพยนตร์ เจ้าหน้าที่ตำรวจจึงจัดการอพยพคนออกจากอาคาร 5 อาคารที่อยู่ข้างเคียงและทำการเคลียร์บริเวณ เจ้าหน้าที่เอฟบีไอและเจ้าหน้าที่ตำรวจใช้บันไดเพื่อขึ้นไปยังห้องพักของโฮมส์ ซึ่งพวกเขาใช้เสาติดกล้องเพื่อตรวจสอบห้อง และยืนยันคำพูดของโฮมส์ เนื่องจากห้องพักดังกล่าวมีกับระเบิดอยู่เต็มห้อง โดยเจ้าหน้าที่ตำรวจอธิบายลักษณะของระเบิดที่พบว่ามีความซับซ้อนมาก ก่อนเกิดเหตุ เวลาประมาณเที่ยงคืน ผู้อาศัยอยู่ใต้ห้องของโฮมส์ได้ยินเสียงเพลงดัง ดังมาจากห้องของโฮมส์ จนผู้อาศัยหญิงคนหนึ่งไปเคาะประตูแล้วบอกว่าจะแจ้งตำรวจ เธอพบว่าประตูไม่ได้ล็อก แต่เลือกที่จะไม่เปิด เธอโทรไปแจ้งตำรวจเรื่องเสียงดังรบกวน แต่ในตอนนั้นเกิดเหตุยิงกันขึ้นพอดี ตำรวจจึงไม่ได้ตอบสนองต่อการโทรแจ้งนี้ หลังเกิดเหตุ เมื่อเธอทราบว่าในห้องมีกับระเบิดอยู่ เธอจึงกล่าวว่า "ฉันกลัวว่าถ้าฉันเปิดประตู ฉันอาจจะทำให้เกิดระเบิดไปแล้ว"
↑ 1.0 1.1 Parker, Ryan; Lee, Kurtis; Ingold, John; Steffen, Jordan; Brown, Jennifer (July 20, 2012). "Family identifies 27-year-old victim of Aurora theater shooting". The Denver Post. สืบค้นเมื่อ July 20, 2012. ↑ "Police: Suspect wore body armor, used assault rifle, shotgun, Glock handgun in theater attack". CBS. Associated Press. July 20, 2012. สืบค้นเมื่อ July 20, 2012. ↑ "Batman premiere gunman looked like 'assassin ready for war'". CBC News. July 20, 2012. สืบค้นเมื่อ July 20, 2012. ↑ Brown, Jennifer (July 21, 2012). "12 shot dead, 58 wounded in Aurora movie theater during Batman premier". The Denver Post. สืบค้นเมื่อ July 21, 2012. ↑ 6.0 6.1 6.2 6.3 Carter, Chelsea J.; Pearson, Michael (July 20, 2012). "Gunman turns 'Batman' screening into real-life 'horror film'". CNN. สืบค้นเมื่อ July 20, 2012. ↑ 8.0 8.1 Muskal, Michael (July 20, 2012). "Questions, but few answers, in Colorado shooting; 12 dead, dozens hurt". Los Angeles Times. สืบค้นเมื่อ July 20, 2012. ↑ "Theater Rampage Jolts Nation". The Wall Street Journal. July 20, 2012. ↑ 10.0 10.1 "70 Shot In Movie Theater Mass Shooting; 12 Killed". The Denver Channel. July 20, 2012. สืบค้นเมื่อ July 20, 2012. ↑ Levs, Josh; Castillo, Mariano (July 20, 2012). "Gunman turns movie into surreal horror: 'This is real'". CNN. สืบค้นเมื่อ July 20, 2012. ↑ Statement by Chief Dan Oates on Channel 7 News, Denver. Date: July 20, 2012. ↑ 14.0 14.1 "Rifle failure that stopped yet more batman carnage". Daily Express. July 23, 2012. สืบค้นเมื่อ July 23, 2012. ↑ 15.0 15.1 "Paul Toohey Horror inside a heart of Darkness". The Advertiser. July 28, 2012. pp. 52–61. ↑ Fahrenthold, David A. (July 22, 2012). "Colorado shooting spree could have been worse; shooter's gun jammed, official says". The Washington Post. สืบค้นเมื่อ July 22, 2012. ↑ GLOCK G23 .40 S&W Compact High Capacity Pistol Bass Pro, 21 July 2012. ↑ Kent, William (July 20, 2012). "Aurora witnesses describe shooter's entrance, chaos". CBS This Morning. สืบค้นเมื่อ July 24, 2012. ↑ Marshall, Jaime (July 20, 2012). "Witness stories from Aurora movie theater shooting". Coloradoan. สืบค้นเมื่อ July 24, 2012. ↑ 20.0 20.1 Horwitz, Sari (July 20, 2012). "Police say Colorado shooting suspect James Holmes had 2 pistols, assault rifle, shotgun". The Washington Post. สืบค้นเมื่อ July 20, 2012. ↑ 21.0 21.1 "Aurora, Colo theater shooting timeline, facts". KABC-TV. July 22, 2012. สืบค้นเมื่อ July 22, 2012. ↑ Kane, Arthur; Ferrugia, John (July 21, 2012). "Sources: Shooter Took Prescription Drug Before Attack". ABC News 7 Denver. สืบค้นเมื่อ July 23, 2012. ↑ Gorski, Eric (July 29, 2012). "Aurora police use patrol cars to ferry injured to hospitals". The Denver Post. สืบค้นเมื่อ 2012-12-15. ↑ "James Holmes claimed to be the Joker, NYPD Commish says". Newsday. Associated Press. July 20, 2012. สืบค้นเมื่อ February 23, 2013. ↑ "James Holmes makes court appearance in Colorado theater shooting". Los Angeles Times. July 23, 2012. สืบค้นเมื่อ August 21, 2012. ↑ Voorhees, Josh (July 20, 2012). "Gunman Shoots 71, Kills 12, at Midnight Dark Knight Opening". Slate. สืบค้นเมื่อ July 20, 2012. ↑ "Aurora theater shooting: 12 dead, 58 injured, chief won't address Joker rumors". Denver: Westword. July 20, 2012. สืบค้นเมื่อ July 20, 2012. ↑ "Aurora shooting: 12 dead as gunman opens fire at movie theater: live updates". The Guardian. July 20, 2012. สืบค้นเมื่อ July 20, 2012. ↑ 32.0 32.1 32.2 32.3 Sandall, Clayton; Dolak, Kevin; Curry, Colleen (July 20, 2012). "Colorado Movie Theater Shooting: Suspect Bought 4 Guns, 6,000 Rounds of Ammunition in Past 60 Days". ABC News. สืบค้นเมื่อ July 20, 2012. ↑ Moreno, Ivan (July 21, 2012). "Police: Colo. Shooting Suspect Bought Guns Legally". ABC News. Associated Press. สืบค้นเมื่อ July 21, 2012. ↑ "Media Updates". auroragov.org. สืบค้นเมื่อ July 22, 2012. ↑ "Miscarriage won't affect charges in Colo. shooting". CBS News. July 30, 2012. สืบค้นเมื่อ July 30, 2012. ↑ Garcia, Arturo. "Authorities release names of Aurora shooting victims". Raw Story. สืบค้นเมื่อ July 22, 2012. ↑ "Colorado Shooting Update: Youngest child being treated is 3 months old". wsav.com. July 20, 2012. สืบค้นเมื่อ July 25, 2012. ↑ "Hospital bills forgiven for Colorado shooting victims". The Christian Science Monitor. July 25, 2012. สืบค้นเมื่อ September 13, 2012. ↑ "Shooting Victims Gain Veto Power in Donation Distribution". The Denver Channel. August 31, 2012. สืบค้นเมื่อ September 13, 2012. ↑ "Aurora movie theater shooting victims to respond to surveys". Denver Post. September 13, 2012. สืบค้นเมื่อ September 13, 2012. ↑ 42.0 42.1 "Profile: Aurora cinema shooting suspect James Holmes". BBC News Online. July 21, 2012. สืบค้นเมื่อ July 21, 2012. ↑ 43.0 43.1 Leonning, Carol (July 20, 2012). "James Eagan Holmes held in Colorado shooting". The Washington Post. สืบค้นเมื่อ July 20, 2012. ↑ Barajas, Joshua (April 27, 2015). "'Through this door is horror': Opening statements begin in theater shooting trial". PBS News Hour. สืบค้นเมื่อ April 27, 2015. ↑ Healy, Jack (August 7, 2015). "A Life Sentence for James Holmes, Aurora Theater Gunman Who Killed 12". The New York Times. สืบค้นเมื่อ August 7, 2015. ↑ Sickles, Jason (August 7, 2015). "Theater shooting verdict: James Holmes sentenced to life in prison". Yahoo! News. สืบค้นเมื่อ August 7, 2015. ↑ Hickey, Chuck (August 26, 2015). "Max: Aurora theater shooter gets 12 life sentences plus 3,318 years". FOX31. สืบค้นเมื่อ August 26, 2015. ↑ Banda, P. Solomon; Peipert, Thomas. "Movie Massacre: Shock, Sadness, a Search for Clues". ABC News. Associated Press. สืบค้นเมื่อ July 21, 2012. ↑ Lohr, David (July 20, 2012). "Colorado Shooting: What We Know About James Holmes (UPDATED)". The Huffington Post. สืบค้นเมื่อ July 20, 2012. ↑ Whitaker, Bill (July 20, 2012). "Colo. suspect James Holmes "smart" but "quiet," teachers and neighbors say". CBS News. สืบค้นเมื่อ July 20, 2012. ↑ Stickney, R.; Tevrizian, Megan; Powell, Brandi (July 20, 2012). "Westview HS Graduate 'Acted Alone' in Deadly Rampage: Investigators". NBC San Diego. สืบค้นเมื่อ July 20, 2012. ↑ The Associated Press (July 21, 2012). "University: CO shooting suspect had federal grant". The Seattle Times. สืบค้นเมื่อ July 22, 2012. ↑ "Statement from the university on James Holmes | Newsroom | University of Colorado Denver". Ucdenver.edu. สืบค้นเมื่อ July 21, 2012. ↑ 56.0 56.1 "Colo. shooting suspect James Holmes' apartment booby trapped, police say". CBS News. July 20, 2012. สืบค้นเมื่อ July 20, 2012. ↑ Stern, Joanna (July 20, 2012). "James Holmes: Colorado Shooting Suspect Had Few Digital Fingerprints". ABC News. สืบค้นเมื่อ July 20, 2012. ↑ Winter, Jana. "EXCLUSIVE: Massacre suspect James Holmes' gun-range application drew red flag". FOX News. สืบค้นเมื่อ 23 July 2012. ↑ Kass, Jess. "Massacre Suspect Holmes to Appear in Court". Bloomberg Businessweek. สืบค้นเมื่อ 23 July 2012. ↑ 60.0 60.1 "Death penalty decision months away, DA says". CNN. July 23, 2012. สืบค้นเมื่อ July 23, 2012. ↑ 62.0 62.1 "Aurora shooting: Suspect James Holmes appears in court". BBC News Online. July 23, 2012. สืบค้นเมื่อ July 23, 2012. ↑ Ingold, John; Fender, Jessica (23 July 2012). "mercurynews.com". mercurynews.com. สืบค้นเมื่อ 24 July 2012. ↑ Winter, Jane. "Colorado movie massacre suspect to be formally charged". FOX News. สืบค้นเมื่อ July 30, 2012. ↑ Banda, Solomon (August 9, 2012). "Lawyers: Colo. Shooting Suspect is Mentally ill". Associated Press. สืบค้นเมื่อ August 9, 2012. ↑ "Prosecutors: Colo. suspect James Holmes made threat in March". USA Today. สืบค้นเมื่อ August 24, 2012. ↑ "Aurora prosecutors drop fight for James Holmes' notebook". The Guardian. Associated Press. September 20, 2012. สืบค้นเมื่อ September 22, 2012. ↑ "Aurora theater shooting: Cops took pill bottles from Holmes' apartment". The Denver Post. January 7, 2013. ↑ "Aurora cinema massacre suspect James Holmes offers to plead guilty". The Guardian. March 28, 2013. ↑ "James Holmes prosecutors seek death penalty against Aurora suspect". The Guardian. April 1, 2013. สืบค้นเมื่อ April 1, 2013. ↑ Minshew, Charles (July 20, 2012). "Map: Aurora theater shooting, suspect's apartment, hospitals". The Denver Post. สืบค้นเมื่อ July 20, 2012. ↑ Holden, Will C. (July 20, 2012). 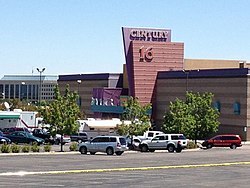 "Slideshow: Aurora theater shooting scene, suspect's booby-trapped apartment". KDVR (Fox 31 Denver). สืบค้นเมื่อ July 20, 2012. ↑ "12 killed in shooting at Colo. movie theater". The Monitor. July 20, 2012. สืบค้นเมื่อ July 20, 2012. ↑ "Colo. suspect's apartment 'booby-trapped'". Clinton News-Record. Reuters. July 20, 2012. สืบค้นเมื่อ July 20, 2012. ↑ "Massacre suspect's neighbor: 'I'm counting my lucky stars'". CNN. สืบค้นเมื่อ July 21, 2012. ↑ "Loud Music Used To Lure People to Booby-Trapped Apt". TheDenverChannel.com. July 20, 2012. สืบค้นเมื่อ July 21, 2012. ↑ "Aurora, Colo. Shooting: Cops may set off suspect's booby traps". CBS News. สืบค้นเมื่อ July 21, 2012. ↑ FLACCUS and RICCARDI, GILLIAN and NICHOLAS. "Movie massacre suspect mum; Batman mask found". Yahoo News. สืบค้นเมื่อ 23 July 2012. ↑ Johnson, M. Alex (July 23, 2012). "Theater massacre suspect appears in Colorado courtroom". NBC News. สืบค้นเมื่อ July 23, 2012. ↑ Flaccus, Gillian; Riccardi, Nicholas (July 23, 2012). "Movie massacre suspect mum; Batman mask found". Yahoo News. สืบค้นเมื่อ July 23, 2012. ↑ "Photos: Residents allowed back into building where alleged shooter lived". thedenverpost.com. สืบค้นเมื่อ July 26, 2012. ↑ Blond, Becka (July 21, 2012). "Tearful vigils remember victims of Aurora massacre". Chicago Tribune. สืบค้นเมื่อ July 21, 2012. ↑ Wing, Nick (July 20, 2012). "Obama Colorado Shooting Proclamation: Flags To Be Flown at Half Staff for Victims". The Huffington Post. สืบค้นเมื่อ July 20, 2012. ↑ Weiner, Rachel (July 20, 2012). "Obama, Romney pull Colorado ads off air in wake of Aurora shooting". The Washington Post. สืบค้นเมื่อ July 20, 2012. ↑ Nakamura, David (July 20, 2012). "Obama, Romney express condolences for Colorado shooting victims". The Washington Post. สืบค้นเมื่อ July 20, 2012. ↑ "President Obama to visit victims of movie massacre". actionnewsjax.com. สืบค้นเมื่อ July 22, 2012. ↑ "Obama heads to Colorado to meet families of shooting victims". CNN. July 22, 2012. สืบค้นเมื่อ July 22, 2012. ↑ "Message of condolence following recent tragic events in the USA, 20 July 2012". royal.gov.uk. สืบค้นเมื่อ July 26, 2012. ↑ "PM Netanyahu Sends Condolence Letter to US President Barack Obama Following the Massacre in Aurora, Colorado". pmo.gov.il. สืบค้นเมื่อ July 26, 2012. ↑ "Condolences to US President Barack Obama". kremlin.ru. สืบค้นเมื่อ July 26, 2012. ↑ "Pope Promises Prayers for Denver Victims". zenit.org. July 23, 2012. สืบค้นเมื่อ July 26, 2012. ↑ Leffler, Rebecca (July 20, 2012). "'Dark Knight Rises' Paris premiere scrapped following U.S. shootings". NBC News. The Hollywood Reporter. สืบค้นเมื่อ July 20, 2012. ↑ "Warner Bros. cancels 'Dark Knight Rises' premieres in Mexico and Japan". Entertainment Weekly. July 21, 2012. สืบค้นเมื่อ July 21, 2012. ↑ "In Wake of Shooting, 'The Dark Knight Rises' Won't Report Early Box Office Figures". The Wall Street Journal. July 21, 2012. สืบค้นเมื่อ July 21, 2012. ↑ "Box office update: Studios not releasing numbers today". Entertainment Weekly. July 21, 2012. สืบค้นเมื่อ July 21, 2012. ↑ Belloni, Matthew (July 23, 2012). "Warner Bros. To Make 'Substantial' Donation to Colorado Shooting Victims". Hollywood Reporter. สืบค้นเมื่อ July 24, 2012. ↑ Morley, Will (July 20, 2012). "Christopher Nolan on theater shooting: 'I would like to express our profound sorrow'". Entertainment Weekly. สืบค้นเมื่อ July 21, 2012. ↑ Malkin, Marc. "Dark Knight Rises Shooting: Christian Bale Visits Victims in Hospital". E! News. สืบค้นเมื่อ July 24, 2012. ↑ "'Dark Knight Rises' Composer Dedicates New Song To Aurora Victims". MTV. July 27, 2012. สืบค้นเมื่อ July 27, 2012. ↑ White, Michael; Palmeri, Christopher; Lee, Edmund (July 20, 2012). "Warner Bros. Said to Pull Some TV Ads for 'Dark Knight'". BusinessWeek. Bloomberg. สืบค้นเมื่อ July 20, 2012. ↑ Macatee, Rebecca. "Gangster Squad Trailer Yanked From Internet, Dark Knight Rises Following Colorado Shooting". สืบค้นเมื่อ July 21, 2012. ↑ Bindley, Katherine (July 20, 2012). "'Gangster Squad' Trailer with Theater Shooting Scene Pulled from 'Dark Knight' By Warner Bros. (UPDATED)". The Huffington Post. สืบค้นเมื่อ July 20, 2012. ↑ Finke, Nikki. "Warner Bros Pulls Trailer of Gangster Shooting Up Movie Theater". Deadline.com. สืบค้นเมื่อ July 20, 2012. ↑ Strauss, Bob (January 20, 2013). "Out of respect for grieving families, "Gangster Squad" scene refilmed after Aurora theater shootings". Denver Post. สืบค้นเมื่อ January 29, 2013. ↑ "'Batman' Movie Massacre – Theater Steps Up for Victims' Funeral Expenses". FM News Weekly. สืบค้นเมื่อ July 28, 2012. ↑ "Century Aurora theater reopens with ceremony, showing of "The Hobbit"". Denver Post. January 17, 2013. สืบค้นเมื่อ January 22, 2013. ↑ "Security stepped up nationwide in wake of Colorado movie theater shooting". CNN. สืบค้นเมื่อ July 21, 2012. ↑ "Colorado Shooting 2012: Witness Says Gunman Shot Anyone Trying To Leave". The Huffington Post. July 20, 2012. สืบค้นเมื่อ July 20, 2012. ↑ Lee, Edmund (July 20, 2012). "Cinema Security Tightened After 'Dark Knight' Shootings". Bloomberg. สืบค้นเมื่อ July 25, 2012. ↑ McKay, Hollie (July 20, 2012). "National theater association reviewing all security procedures in wake of Colorado midnight movie massacre". Fox News. สืบค้นเมื่อ July 25, 2012. ↑ "Security Recommendations Sent To Theater Owners". Hartford Courant. July 20, 2012. สืบค้นเมื่อ July 25, 2012. ↑ "AMC Theatres Statement About Aurora, Co. Incident". AMC Theatres. July 21, 2012. สืบค้นเมื่อ July 22, 2012. หน้านี้แก้ไขล่าสุดเมื่อวันที่ 4 พฤษภาคม 2560 เวลา 17:01 น.